In my business I often rely on referrals, so it’s important to ensure that I not only have satisfied customers, but that I also help my customers become my advocates. According to Matthew, advocates differ from “satisfied customers” in that they support the brand through good times and bad, and will actively react to negative comments about the brand in the online community or by word-of-mouth. These advocates, says Matthew, openly praise the company, products and employees both internally and externally via social media and other channels. They provide feedback about service and quality and sometimes even feel as if they are brand protectors. These customers, says Matthew, feel a sense of ownership in the brand and think of the brand as part of their inner circle. The question is, how do you take a loyal and satisfied customer and create a dedicated, persuasive brand advocate? If you identify and work with your detractors, you can get at the root of customer dissatisfaction. Then, says Matthew, prioritize the customers and customer pockets responsible for the negative comments, address the issues and correct them immediately. According to Matthew, customer satisfaction and loyalty are critical to the success of any business, so it is essential that every interaction your customer has with your company and its employees is positive. 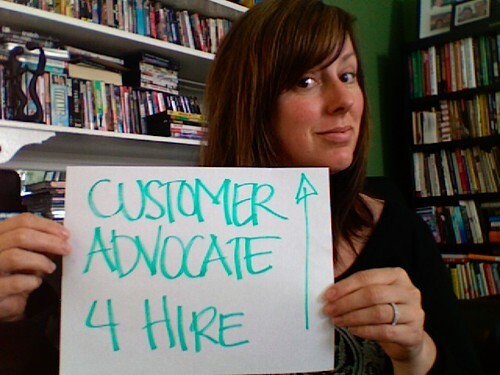 I agree, a happy and satisfied customer is your best customer advocate. Rather than just rely on your loyal and satisfied customers to boost your brand, do something that will turn your average customer into an advocate by going above and beyond their expectations. I think that offering special perks, bonuses, coupons or “customer appreciation” cards are all great, but try offering something really different or out of the ordinary to create excitement and brand connection. This entry was posted on Friday, June 10th, 2011 at 10:51 am	and is filed under Advertising, Branding, Entrepreneurial, Leadership, Managing, Marketing. You can follow any responses to this entry through the RSS 2.0 feed. You can leave a response, or trackback from your own site.